SurveyMonkey Appy is a customizable and user-friendly online application management system used by universities, associations, and other organizations to streamline the process of collecting, administering, and reviewing grant applications. SurveyMonkey Apply permits organizations to integrate the system into their existing workflows so they can automate their tasks, save time, and drive their mission forward. 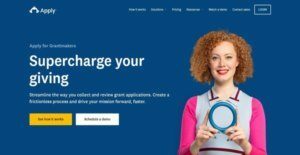 The online application management system delivers a frictionless experience for both grant applicants and grantees, allowing them to send and track data, document, materials in one place. To make the process of collecting and reviewing grant applications simple and painless, the system enables users to create easy-to-use online portals where they can gather applications and access updates and reports about the grants and other programs they are managing. SurveyMonkey Apply helps users gain insights into their data so they can come up with decisions faster and improve results. Through the aid of dashboards, they will be able to access and analyze real-time application, review, and funding data. They can also generate powerful reports by simply clicking a button. SurveyMonkey Apply makes it easy for users to collect grant applications. One feature of the software is that it allows grantseekers or grant applicants to submit requirements through a brandable online portal. All the requirements they are submitting can be easily checked by grantees from the same portal. To be able to capture all the information they need from grantseekers, users are given the opportunity to create dynamic online forms. They can build more than 20 types of questions and even apply skip logic. Another grant application collection feature offered by SurveyMonkey Apply is the capability to set up eligibility quizzes. With this feature, reviewers can conduct pre-screening of applicants automatically to check whether they are qualified to receive grants. Managing and administering grants is often a cumbersome process. However, with SurveyMonkey Apply, such process can now be automated. In fact, users can create their own automated program-specific workflows and customize them. Here, they can set up workflows that are comprised of multiple stages wherein applicants can quickly move through the stages of each process. Because the software can automate workflows and processes, users no longer need to spend much time doing repetitive administrative tasks. Validating grant applications and sending notifications to applicants and other persons involved in the process can be done automatically. SurveyMonkey Apply has a relationship management feature that simplifies how users communicate with their constituents. This enables them to send email messages to their constituents as well as keep track of all email communications. In SurveyMonkey Apply, all actions and activities being performed within the software can be monitored. Through the aid of its intuitive dashboards, users can access data on their grant management processes and gain insights into everything happening throughout such processes. The online application management system provides features that are exclusive to reviewers. Among those features is the side-by-side review feature. In this feature, reviewers can simultaneously access application materials and accomplish review forms. As a result, reviewers don’t have to switch between multiple screens and shuffle through papers. As reviewers check grant application requirements and materials, the software permits them to do simple reviews through which they can scale applications just by answering yes/no questions or rating them from one to five. If users want to enable advanced reviews, that is also made possible, letting them create custom review forms that contain various question types. A feedback feature is also included in SurveyMonkey Apply. Reviewers can add notes and comments directly to applications. If they discovered issues in the application materials, they can leave feedback straight on the materials. While the software automates the grant application collection process, it also makes sure that the grant application review is automated. Thus, applications can be automatically routed to reviewers according to any criteria that users have set. SurveyMonkey Apply aims to eliminate data silos – repositories of data that are restricted to specific departments within the organization. Data silos prevent users to exchange data between their departments, thereby making it very difficult for them to establish a fluid collaboration across their organization. This issue is resolved by SurveyMonkey Apply through its integration features. For example, the software can work with Salesforce, allowing users to push and pull information between the application management software and the CRM system. In addition, SurveyMonkey Apply is equipped with a comprehensive set of APIs. With these APIs, users can connect the software to a variety of third-party applications and access the data from those applications within SurveyMonkey Apply and vice versa. If you are considering SurveyMonkey Apply it may also be beneficial to examine other subcategories of Best Grant Management Software listed in our base of B2B software reviews. Since each enterprise has specific business requirements, it is sensible for them to abstain from searching for a one-size-fits-all perfect software system. Needless to say, it would be pointless to try to find such a platform even among popular software platforms. The intelligent thing to do would be to jot down the various vital aspects that require consideration such as required features, finances, skill levels of employees, company size etc. Then, you should do your research thoroughly. Read some SurveyMonkey Apply reviews and look into each of the other systems in your shortlist in detail. Such exhaustive homework can make certain you reject ill-fitting systems and select the solution that provides all the elements you need for business success. How Much Does SurveyMonkey Apply Cost? We realize that when you make a decision to buy Grant Management Software it’s important not only to see how experts evaluate it in their reviews, but also to find out if the real people and companies that buy it are actually satisfied with the product. That’s why we’ve created our behavior-based Customer Satisfaction Algorithm™ that gathers customer reviews, comments and SurveyMonkey Apply reviews across a wide range of social media sites. The data is then presented in an easy to digest form showing how many people had positive and negative experience with SurveyMonkey Apply. With that information at hand you should be equipped to make an informed buying decision that you won’t regret. What are SurveyMonkey Apply pricing details? What integrations are available for SurveyMonkey Apply? If you need more information about SurveyMonkey Apply or you simply have a question let us know what you need and we’ll forward your request directly to the vendor.